The first section is the 'Management' section. 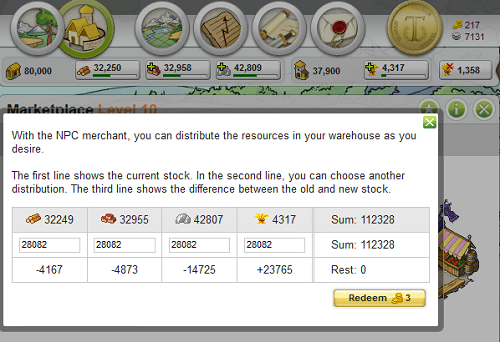 Here you can trade with the game in a 1:1 ratio. 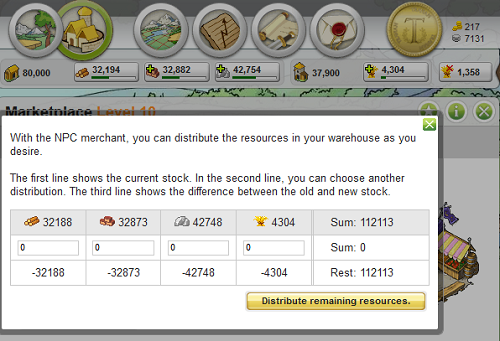 This means that you can redistribute your resources in any amount you want as long as they are completely balanced out. 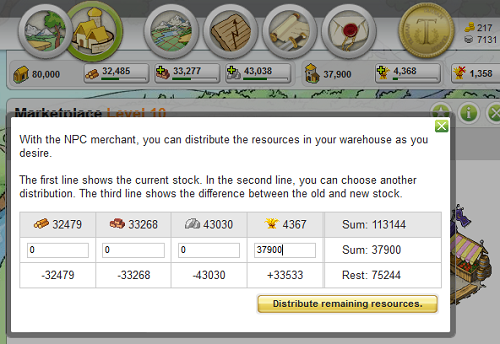 To NPC resources click on the 'Exchange resources' button. This will open a window where you can distribute your resources. 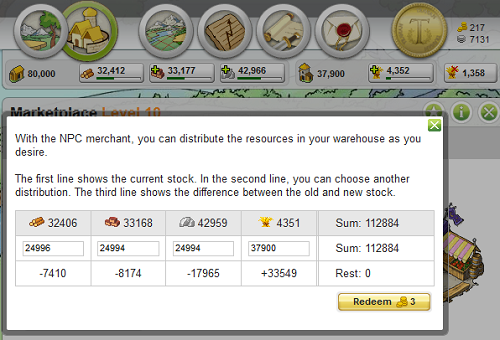 If you click the 'Distribute remaining resources' button it will automatically balance the amounts between wood, clay, iron and wheat. You will then need to click 'Distribute remaining resources' and the system will spread the rest of the resources evenly between wood, clay and iron. The next section is the 'Send Resources' section. To send resources fill in the amount of each resource to send and click 'prepare'. You will get a confirmation screen showing you the information you filled in. 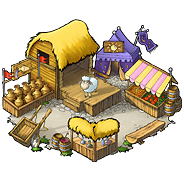 This includes the amount of resources, the village name where it's being sent to, player name, alliance, duration of the trip, number of merchants and how many times they will be sent. Make sure this information is correct as you would not be the first to send resources to a complete stranger because of filling in wrong account name or coordinates. There is no way to stop this process once you click 'Send resources'. Please note that you cannot send resources to other players while being under beginner's protection; however you will be able to use the below described trade options (buy and offer). 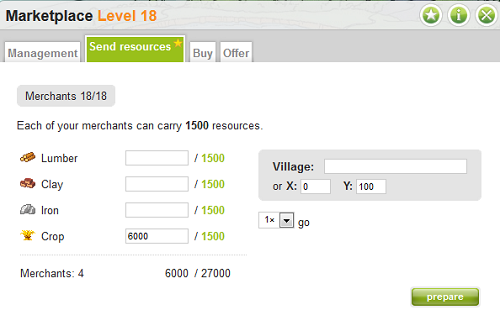 The 'Buy' section is used to buy resources from other players. 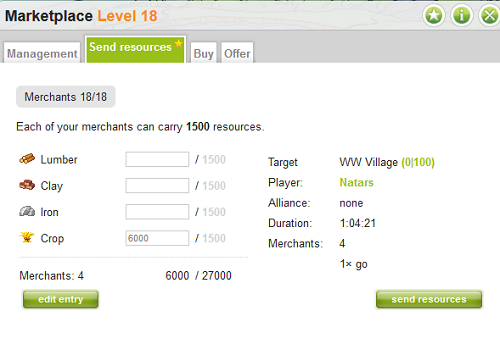 If you have enough merchants and resources, you can click the 'accept offer' link next to an offer and the merchants will be on the way. Be careful, once you have clicked a link the offer is immediately accepted, there is no confirmation screen like in the 'send resources' screen. You can see the tribe of the player who offered the trade and the ratio as a color-code for each offer. 1:1 or better trade offers are printed in green, 1:1 to 1:1.5 offers are printed in yellow and all offers above 1:1.5 are printed in red. The fourth section is the 'Offer' section. 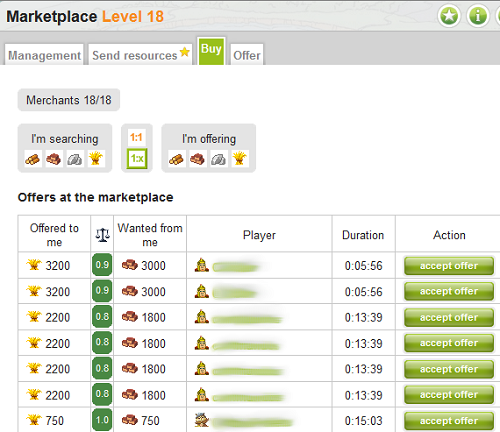 Here you can place your own offers on the Marketplace and wait for them to be accepted by other players. You must have enough merchants and resources available.If you don't want your merchant(s) to be on the way for days, you should set the maximum time of transport. 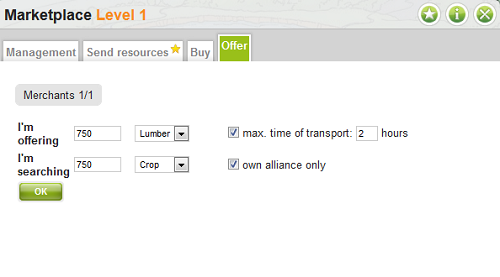 You can also select to allow only players from your alliance to accept.